Have you ever had a sudden, all-consuming need for adventure? That need came to me around 12:45 a.m. on a cold night in February as I was staring at the ceiling of my room, feeling like the walls of my life were closing in around me. It had been a horrible week. A project that I had been working on for almost a year had just fallen through, and I had found out that an integral person I had been working with in the project had made out with much more than just my pride, but also large sums of money – and I was left to clean up the aftermath. Even though I pretended to everyone around me that I was strong and on-top-of-the-world, I was slowly falling apart. Tears began streaming down my face as I felt completely hopeless and powerless against my situation – I had fought so hard only to fail. Around 12:46 as I was admittedly wallowing in self-pity and wondering “how in the world this could have happened to me”, I realized that I had arrived to the moment that I had coached so many people through, the moment that truly defines your character and spirit. When the chips are down, when you are broken, when you are discouraged, when you feel like you have nothing left, do you give in? Or do you pull up your bootstraps and say, “Bring it on”? The decision was mine to make. And looking at the grand scheme of things, I had been through much worse. I had fought bigger demons and won. When you look death in the face at ten years old and manage to come through it, you certainly gain a different perspective. I had survived being crushed in the back of a car and the succession of painful years to follow, years of being insecure, ashamed and afraid, and relearning how to do life being paralyzed by a spinal cord injury. At the time, I didn’t really understand the concept of “taking responsibility for your own life” or how one truly mastered themselves in spite of difficulty. All I knew was that all of the sudden my world had changed, my body had changed, people were criticizing me for it, people were leaving me for it, and I was afraid. Skip to my late teens, when I realized that holding on to the pain and trauma of the past was way more trouble than it was worth, and I decided to turn this “weakness” into an incredible strength – I realized it could lead me to find a way to tune into an inner power that I didn’t know existed, a way to motivate others on their journey toward success, and even a way to create a career that I loved. Having been the little girl who was afraid to speak too loud in a room full of people, it certainly came as a shock to me (and many others I’m sure) when my journey led me down a path to begin public speaking. Even more of a surprise though was that by continually forcing myself to chase this great fear of mine, I ended up growing an intense passion for speaking – so much so that a couple years later I found myself on the spotlighted end of a microphone, pouring my heart and soul into a platform speech at the Ms. Wheelchair USA competition. A competition that somehow, I won. I began my year as Ms. 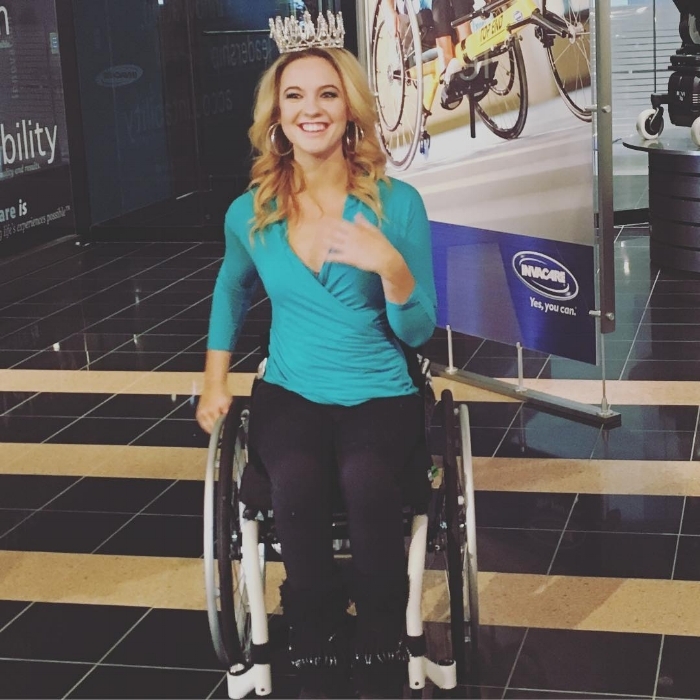 Wheelchair USA with a fiery passion to motivate others on my platform Live Boundless: how to decide (because it is a decision) not to be bound to your circumstances, not to be bound to a wheelchair, but rather, to empower yourself with creative and innovative solutions to thrive no matter what your physical challenge may be. As I laid in bed and reminded myself of this mission and how far I had come, I was invigorated with a new sense of purpose and strength. I could choose to believe that something good could come out of something bad. I could choose to direct my actions to continue moving toward a positive force. I could choose a great adventure. Minutes later the idea hit me like a lightening bolt. I didn’t want to just tell people about how to “live boundless”, I wanted to show them a physical representation of what it means to look fear in the face and say, “You do not own me. I have the power to choose not to listen to you.” I sat straight up in bed and knew exactly what I needed to do. I wanted to travel across the country, coast-to-coast, and do things that represented “fear-chasers” and show how it is possible to live a bold, joyful and fearless life even through the challenges life can throw at us. The idea consumed me. For the next two months I worked feverishly to make my new dream a reality - scheduling tours and events, planning the tour route, raising money. Most of me was absolutely terrified, wavering back and forth from feeling innovative one day and crazy the next, but driven by a singular purpose – proving to myself and others the life-changing power of courage. One of my biggest priorities in preparation was making sure that I had the right equipment for taking on such a massive feat. In particular, I needed a wheelchair that could get across multiple terrains, was slender enough to get through narrow spaces, one that had easy maintenance and could hold up under the pressure of the extreme situations I was about to put it under. I couldn’t have something that would fail me when trying to make it through the Black Hills while rock climbing or would pop a tire on the rocky ride of cave exploring! It is my honor to say that this dream has become a reality – the journey has begun. Together we will get to test the limits on the “wheel” possibilities – from mountain biking in Utah to paragliding in Idaho, exploring the world of adapted adrenalin sports, but more importantly, beginning the journey together of choosing to overcome and doing something that tests our belief on what is possible. Are you ready to live boundless?